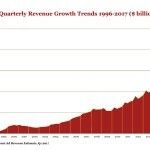 U.S. digital advertising revenues reached an all-time high of $59.6 billion in 2015, according to the full-year IAB Internet Advertising Revenue Report, released today by the Interactive Advertising Bureau (IAB) and prepared by PwC US. This marks a 20 percent surge over the earlier record-breaking 2014 revenues of $49.5 billion – and represents the sixth year in a row of double-digit growth for the industry. In addition, the report shows that 2015’s fourth-quarter numbers reached $17.4 billion, a 23 percent increase from $14.2 billion in Q4 2014, and an 18 percent increase from the $14.7 billion in 2015’s third-quarter. “There is no question that interactive screens are attracting consumers and the advertisers that want to reach them where they live – increasingly on mobile devices,” said Sherrill Mane, Senior Vice President, Research, Analytics, and Measurement, IAB. The survey includes data concerning online advertising revenues from Web sites, commercial online services, free email providers, and other companies selling online advertising. The full report is issued twice yearly for full- and half-year data, and top-line quarterly estimates are issued for the first and third quarters. PwC does not audit the information and provides no opinion or other form of assurance with respect to the information. A copy of the full report is available at iab.com/internetadrevenue.